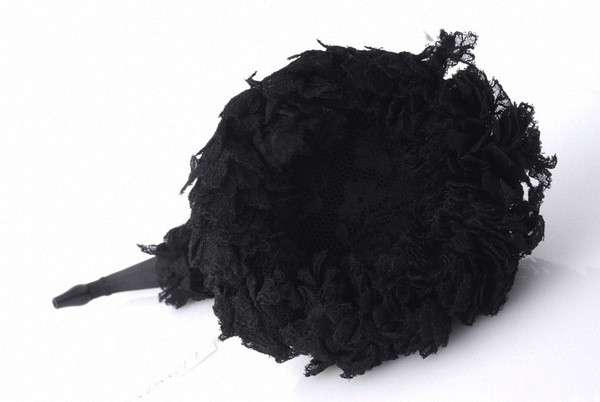 Photograph of a Victorian hearing trumpet swathed in black fabric and lace. Image courtesy Wellcome Library, London under a Creative Commons License (Museum No. A129677 and Museum No A129677). The ear trumpet is among the earliest hearing aid devices designed to bring sound more effectively to the ear, dating to as early as 1800 when manufacturer Frederick Charles Rein opened shop in London (later becoming F.C. Rein & Son). They came in various designs from long trumpets 16” to 19” inches in length, to collapsible trumpets that could be placed in an individual’s pocket, banjo-styles, or bell/dome types that were popular for their ability to resonate sound effectively—the greater an individual’s hearing loss, the larger the instrument was recommended for use. These hearing trumpets, however, were very conspicuous devices and drew attention to an individual’s hearing loss. In the nineteenth century, a design trend towards hearing instruments favouring concealment became popular; large devices were redesigned to be worn on the person, as part of their attire, or masked as furniture. As hearing trumpets and devices became aesthetically appealing and socially acceptable, more individuals were making use of them to improve their hearing losses. 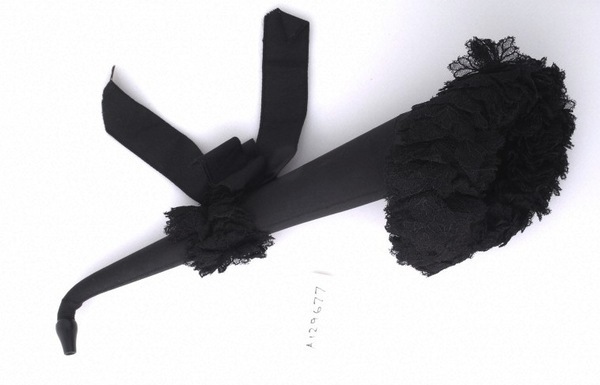 This particular nineteenth-century hearing trumpet is a unique one, designed for use during a woman’s mourning period, to blend in with her clothes, as evident by the black fabric, lace, ribbon, and earpiece wrapping the device. It was likely constructed by one of the popular hearing aid instrument makers in London—F.C. Rein & Son, or T.Hawksley, Ltd., on Oxford Street, which was established in 1869 (later Hawksley & Sons). This hearing trumpet was part of the elaborate accoutrements of Victorian mourning inspired in part by Queen Victoria’s 40-year mourning period following the death of King Albert in 1861. Lavish funerals, formal garments, black-bordered stationery, were all part of the complicated and dignified mourning period, clearly an aspect for the wealthier parts of society, though in some cases these mourning rituals may served as sources of financial anxiety and commercial exploitations (Clewell 2004). The mourning period also invoked a strict and fashionable dress code which was applied rigorously to widows, who were required to wear full black mourning for at least two years. Extravagance and social emulation were part of the mourning rituals for the middle-classes and were reflected in fashion magazines such as Queen or Gentlewoman that outlined dictations for refinements and mourning and even updated mourning outfits according the latest season’s fashions (Jalland 1996:301). Advice manuals such as Manners and Rules of Good Society, or Solecisms to be Avoided (London: Frederick Warne & Co., 1887) also provided clear instructions for devotion to the mourning period. It was believed that mourning clothes, fashion, furniture, or even ear trumpets were the grieving family’s way of displaying their inner feelings over the loss of a loved one. Tammy Clewell, “Consolation Refused: Virginia Woolf, The Great War, and Modernist Mourning,” Modern Fiction Studies 50.1 (2004): 197-223. Jalland, Pat. Death in the Victorian Family. Oxford: Oxford University Press, 1996. Berger, Kenneth W. The Hearing Aid, it’s Operation and Development. Michigan, USA: National Hearing Aid Society, 1970. Uknown, “Ear Trumpet in Mourning,” Nineteenth-Century Disability: Cultures & Contexts, accessed April 23, 2019, http://nineteenthcenturydisability.org/items/show/26.